The bizarre and brilliant Bill Bailey brings his comedy show Larks in Transit to Wyndham’s Theatre from December this year. With his musical virtuosity, surreal tangents and trademark intelligence, Bailey tackles politics, philosophy and the pursuit of happiness as he shares with his audience two decades of travelling mishaps, or ‘larks’. The irreverent comic fashions a symphony from a ringtone, tells the real story of Old McDonald, and re-imagines the Stars and Stripes in this show that has garnered rave reviews during its UK tour. Bill Bailey is an English comedian, musician, singer, actor, TV and radio presenter and author. He is known for his role in ‘Black Books’ and for his appearances on ‘Never Mind the Buzzcocks’, ‘Have I Got News for You’ and ‘QI’, as well as his stand-up. Larks in Transit features tales from Bailey’s time as a globetrotter and wildlife documentary filmmaker. A giant circular map at the back of the stage acts as his backdrop, follow him as he zips through places like Brazil, Estonia and Indonesia switching from satire to surrealism in an instant, negotiating all kinds of objects include Brexit and birdsong. This compendium of travellers’ tales and general shenanigans is not to be missed. LOOKING FOR CHEAP BILL BAILEY - LARKS IN TRANSIT TICKETS AT WYNDHAM'S THEATRE? With our huge range of cheap tickets for comedy shows on in London, a visit to the West End has never been better value. 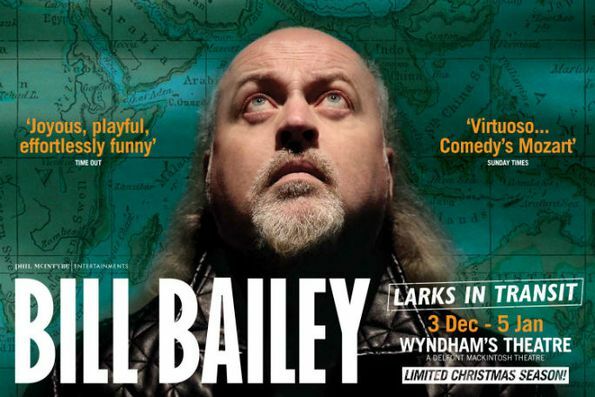 Book with us for Bill Bailey - Larks in Transit and enjoy a great comedy show at a price that won’t bring down the curtain on your budget. Bill Bailey - Larks in Transit is not available to book, please sign up to our newsletter for updates and offers on forthcoming and available shows. Where is Bill Bailey - Larks in Transit?